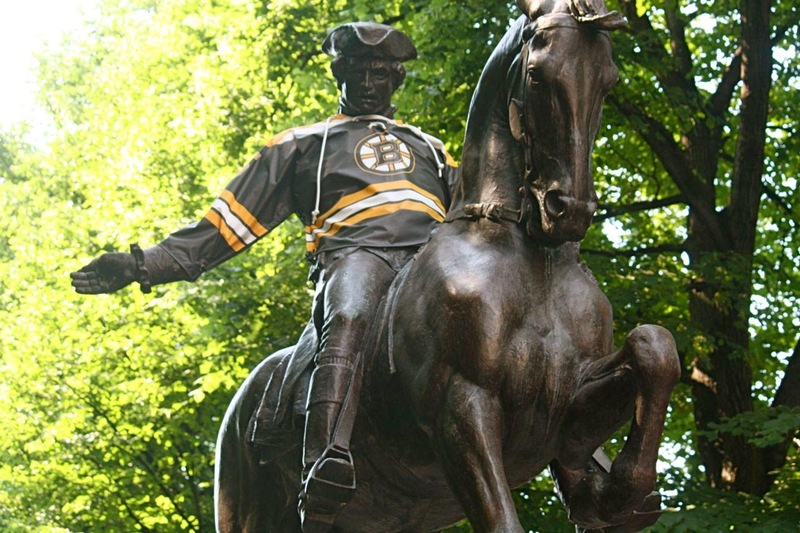 One of the most iconic statues in the city of Boston is of Paul Revere on horseback near the Old North Church. This figure of the early American hero who warned his fellow patriots of the arrival of British troops has in recent history managed to show his support of the Boston Bruins by donning his Black & Gold jersey emblazoned with the "8-spoked B". The image came to my mind as I thought about the red-shirted invaders from Detroit now joining the fray in the newly formed Atlantic Division. Suddenly I was transported back to a middle school history classroom. I could hear my teacher invoking the words of the poet Henry Wadsworth Longfellow... and my mind wandered. For Lord Stanley's Cup facing Wings from the West. Ready at a moment's notice for a message to send. Only a mere week and a half away. And three if by ice for our new rivalry. With Datsyuk and Zetterberg and Cleary in flight. With Bertuzzi and Franzen, Helm and Nyquist. 'Let's go Bruins!' shall fill the night sky. TD Garden will tremble and end boards will rattle. And Looch stares off with silent rage. Deke and drive and cut and pass. The puck rockets by Howard past the blade of his stick. Jimmy's head slumps, mask dripping with sweat. And out of the speakers 'Zombie Nation' will pour. To arms! To arms! For the Cup we fight! The Red Wings are coming. Welcome East... and good night." I lifted my head off the kitchen table and rubbed my eyes. Was this a dream? A premonition? Then reality settled in. The season opener is still a week away on October 3rd and pits the Bruins against the Tampa Bay Lightning. 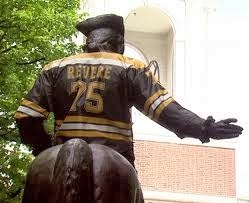 We'll have to wait until Saturday the 5th for Paul Revere's next ride.